I love diverse places, especially those that take me by surprise. 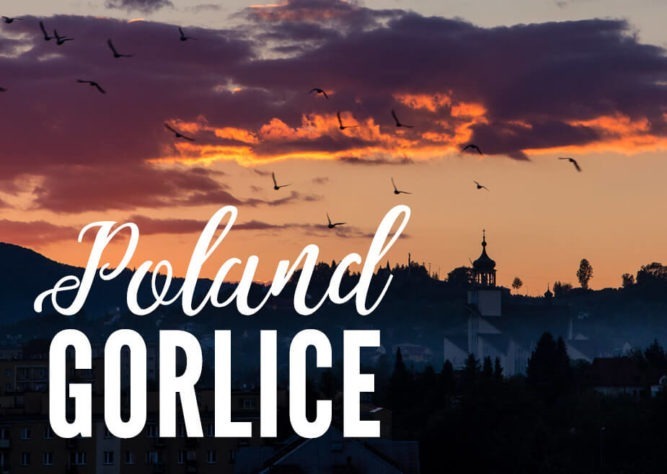 When I was getting ready to visit the Polish city of Gorlice, my expectations were not high. After all, if I never heard about the city before, it can’t be anything too special, right? Well, it turned out I was completely wrong. Gorlice is actually quite amazing. 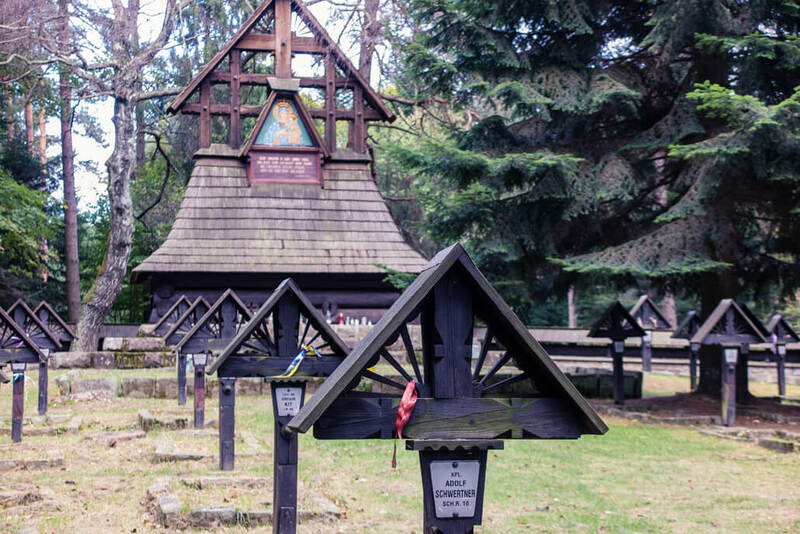 Let me take you to Beskid Niski, the Gorlice region, a melting pot of cultures and a witness to significant historical events. If you were to find the town, you’d have to look at Lesser Poland, the Lower Beskids (Beskid Niski) area, just north of the Slovak border and halfway between the borders of the Czech Republic and Ukraine. The closest major Polish city is Krakow. Everything revolves around crude oil in the Gorlice region. 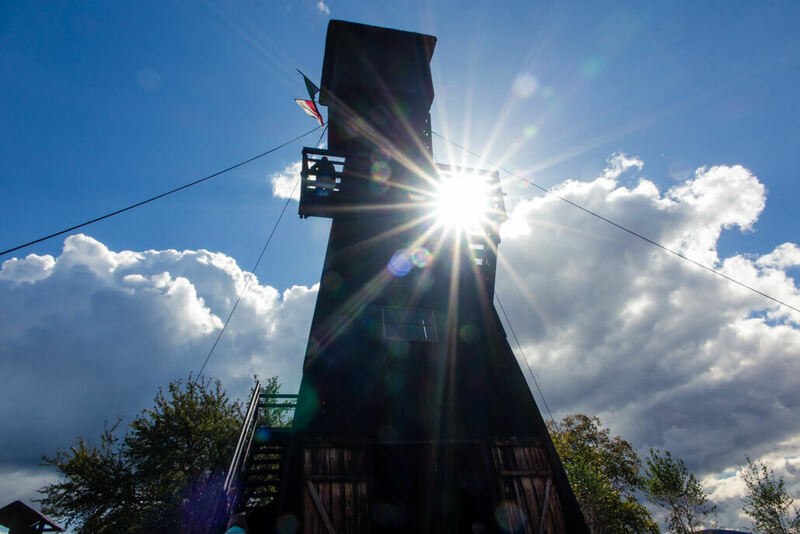 And it’s no wonder why – the world’s very first oil mine was dug right here! The oil was first discovered here in the 16th century, when it was simply flowing out from the underground. In nature. What would you do if you suddenly saw black thick liquid seeping from the ground while being dug in? Locals were scared and thought it was a sign of a curse. But with time, they explored the liquid and came to realization that wheels would run better when lubricated with the oil. It took a few hundred years of experimenting with various methods of constructing the oil mines to finally find the right one. From simple holes in the ground reinforced with wood into which people were lowered in buckets, to hand dug wells. 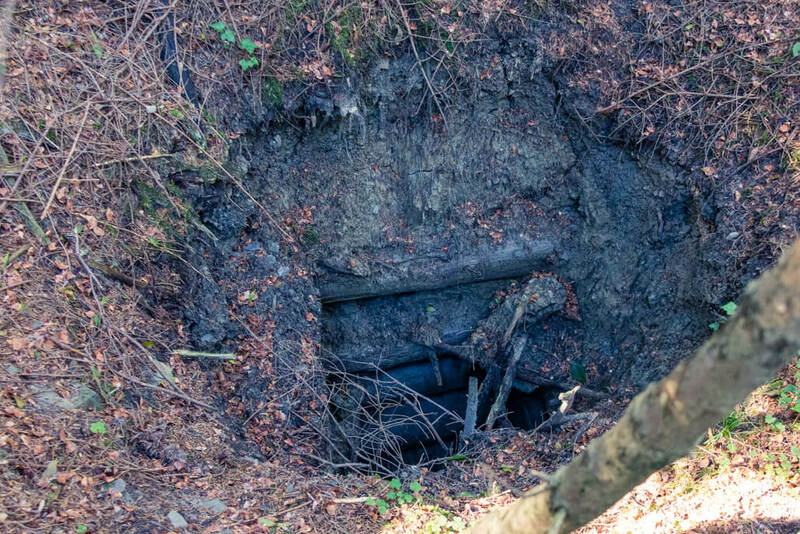 Hand dug hole for crude oil extraction near Gorlice – people were lowered in buckets into these holes! Only in the late 19th century a more sophisticated method was discovered – the one using masts, tripods and pumpjacks. It was apparently the experienced miners from Silesia who taught locals, who then became highly demanded all over the world. Legend has it that it wasn’t uncommon for an oil miner to suddenly disappear without telling anyone, and would then send letters home to relatives from places as far as Borneo. Many people became rich due to oil mining. Owning an oil field would bring significant fortunes to the people involved. Among those e.g. Władysław Długosz, who we’ll talk about later :), or a lady named Józefa Szymonowiczowa, who, thanks to oil money, was able to have a Neogothic church built. To see the remnants of Polish oil mining firsthand, visit the ‘Kopanki’ (=dug holes) in the forests near Gorlice (with a guide!) 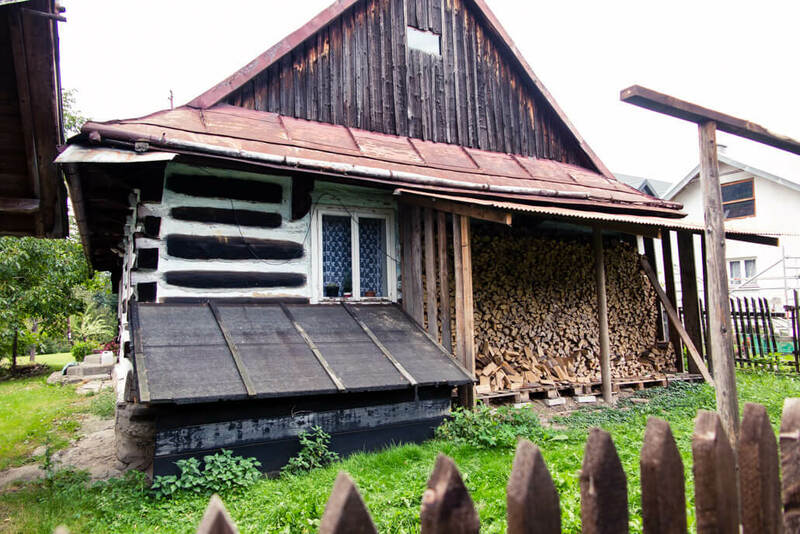 between Siary and Owczary (exact location here) or go to the open-air museum of the Magdalena Mine just outside Gorlice. People were mostly using the crude oil for lubricating the wheels, but other uses emerged too. Among the most significant ones, especially for the city of Gorlice, was the discovery of lamp oil and the creation of street lamps. A Polish pharmacist Ignacy Łukasiewicz came up with his life’s most significant invention while living in Gorlice – a kerosene street lamp. 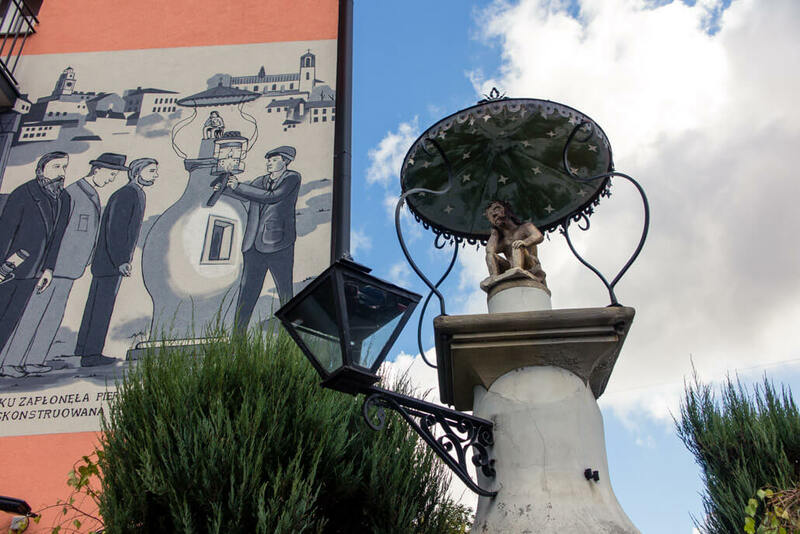 The first lamp was lit in Gorlice in 1854 and a whole monument is built around it to commemorate the event. Łukasiewicz legacy actually created a whole new industry, since he was the first person in the world to distill crude oil. He was quite entrepreneurial too, having opened several oil wells, becoming wealthy in the process, and ultimately setting up worlds’ first industrial oil refinery in 1856. This liquid is the future wealth of the country, it’s the wellbeing and prosperity of its inhabitants, it’s a new source of income for the poor, and a new branch of industry which shall bear plentiful fruit. 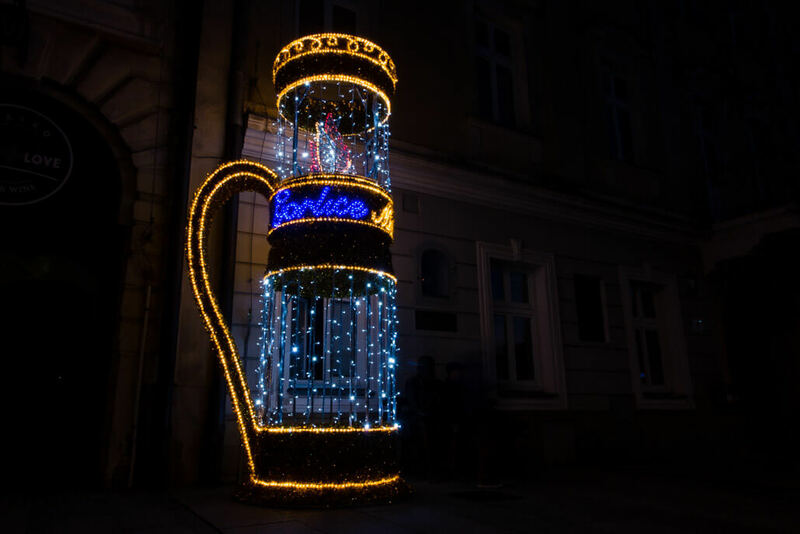 The fact that Gorlice is the City of Light is also demonstrated in their yearly light shows. 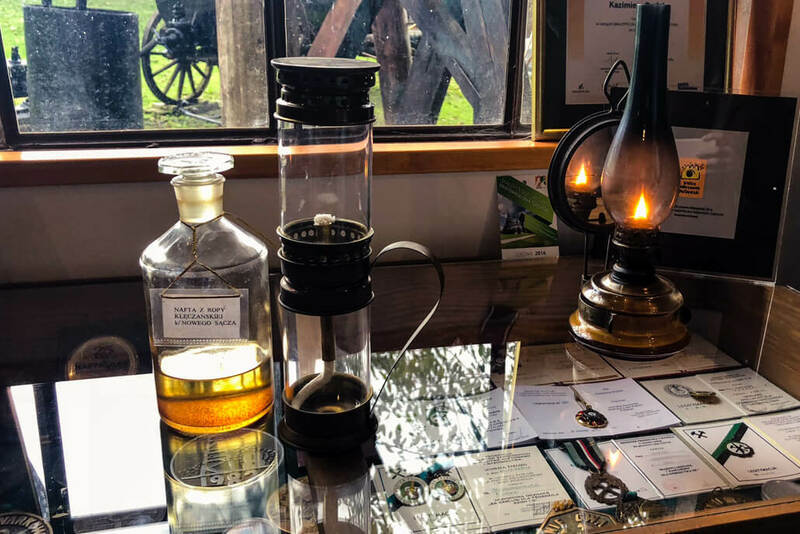 In fact, 2018 marks 165 years since the ignition of the oil lamp. 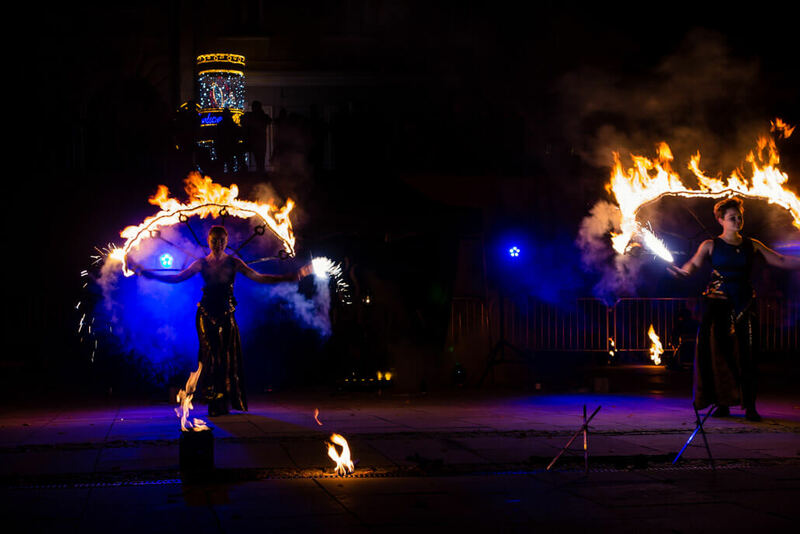 To celebrate, the city organized an amazing fire show at the end of September. As prosperous as the oil era was, the destructive force that followed hit Gorlice with an equal magnitude. The First World War put an abrupt end to the oil rush. In 1914, the Battle of Gorlice took place, which turned out to be one of the most important events in WW1 as it put Russia on the losing side of the game. Russia had been interested in the area since it was strategically convenient, being near the border of Slovakia, the Great Hungarian Plain and Budapest – and they kept moving closer to occupy the territory. Austria-Hungary together with its ally Germany identified the Eastern Front at Gorlice – Tarnów as the weakest point of the Russian advance and launched an offensive there. Having over 100,000 soldiers and large amounts of advanced artillery, they were better prepared and thus their victory was imminent. Still, it took 15 long days for Russia to start retreating. You can read all about the battle on Wikipedia here. 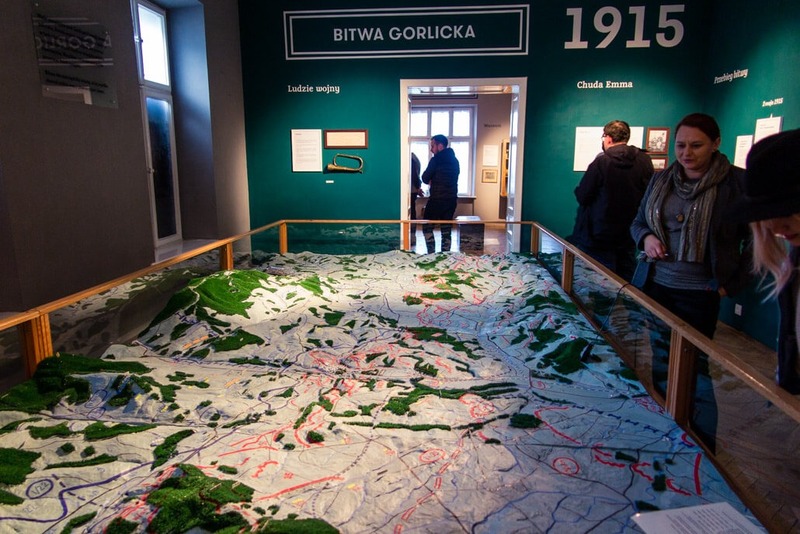 Or, even better, visit Gorlice’s Museum (in Polish only), which has been cutely named the “Ignacy Łukasiewicz Polish Tourist Country Lovers’ Society” (PTTK). The lady there knows everything! The battle of Gorlice eventually led to the restoration of Poland’s independence, supported by the alliance of the US, Britain and France. More than 20,000 soldiers died in the battle. What’s left behind is a landscape dotted with 200 eerie military graveyards. Cemetery no. 123 is the largest and is inscribed on UNESCO list. We visited cemetery no. 60 at the Malastowska Pass which has 174 soldiers of Austro-Hungarian army and 36 unidentified soldiers buried there. Despite having different layouts and designs, all the cemeteries have one thing in common: no matter the ethnic, religious or military affiliation, all faithful fallen soldiers and their graves were treated with the same respect. 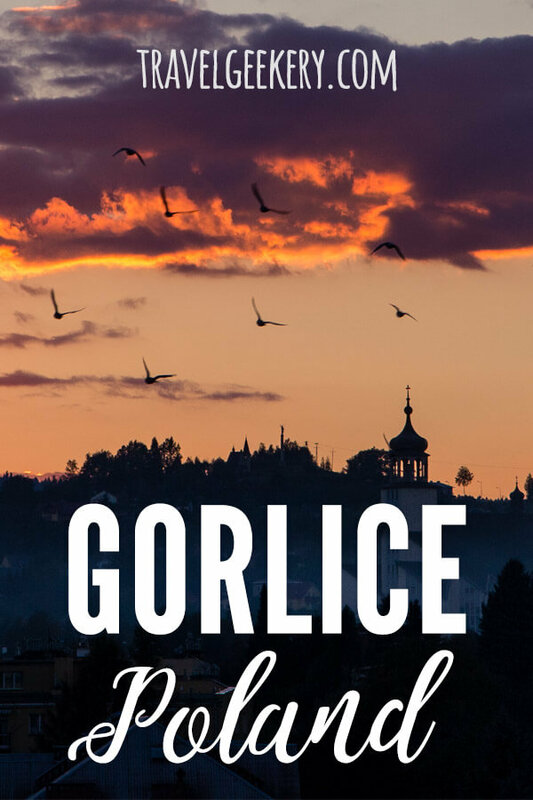 Needless to say, the Second World War was no less cruel to the inhabitants of Gorlice. The road cutting through a park leads to a Palace. Długosz Palace. Looking more like a hunting lodge on the inside, the centuries old mansion breathes history. Originally built around the 14th century, the palace was owned by the Dembowski family for hundreds of years. 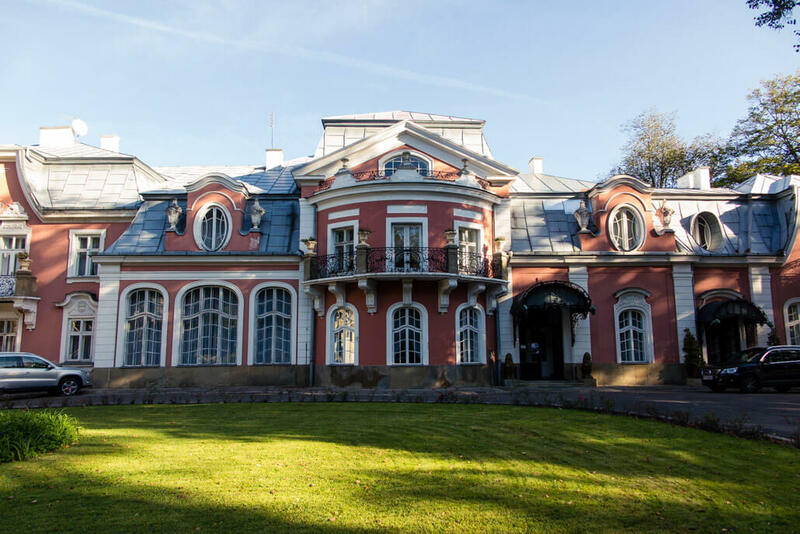 However, the story of the Palace intersects with one of the most famous Gorlice residents and a man who made his fortune during the oil rush – Władysław Długosz. Długosz came to Gorlice at the end of the 19th century, looking for oil. He lost all his money, since he was looking in the wrong places first. At that moment, he fell in love with the daughter of the Palace’s owner, who didn’t approve of their love due to Długosz’s poverty. Długosz Family Palace in all its glory – nowadays also a unique hotel! 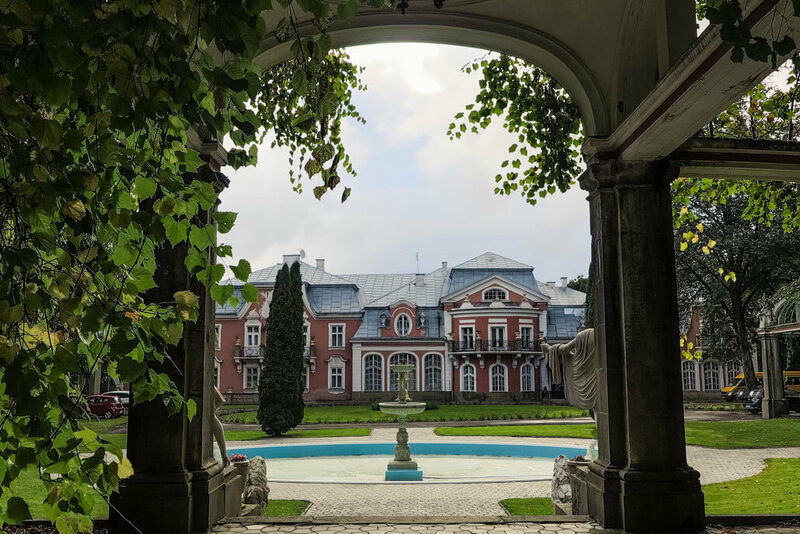 Długosz significantly renovates the Palace, has a beautiful garden designed and invites a young sculptor to fill it with statues. There are around 60 sculptures in the Palace’s park, which makes it the largest collection of the author. Nowadays, in the autumn of 2018, the Palace got a new owner. After years of being closed, the gates have reopened and locals flocked in. We witnessed it first hand as we were staying at the Palace! If you also want to feel like a royalty, book your stay at the Długosz Family Palace. 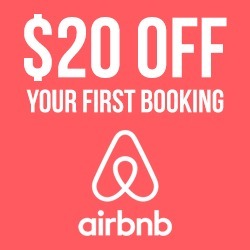 The price is around €50 per night only! It takes about 40 minutes by foot to walk from Długosz Palace to Gorlice city center, so it’s best if you have a car at your disposal. So what do you think? Doesn’t this look like an amazing place to stay? 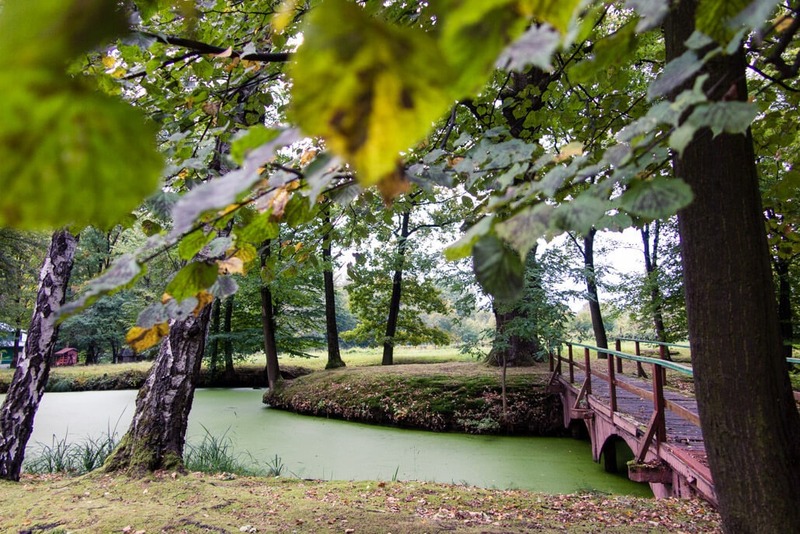 The back of the Długosz Palace offers cozy corners and beautiful views over the nearby landscapes. Lemkos form an ethnic group that used to inhabit the area, together with parts of Ukraine and Slovakia. The Lemkos have their own language and culture. Still in a census in 2011, a few thousand people identified themselves as Lemko nationality only, with even more declaring a double nationality: Lemko and Polish. The Lemko people even had their own sovereign state, but only for a short period of 2 years from 1918 – 1920, between the period of the Austro-Hungarian Empire and becoming a part of Poland. Do you know who the most famous Lemko person was? Andy Warhol! He originally came from the Ukrainian part of the Lemko region. The Lemko women used to make and wear intricate beaded collars called krywulka. It was a status symbol and a point of pride and some of the largest krywulkas were made with thousands of glass beads! What ties the Lemkos even more to the region is the way they sustained themselves. Since agriculture was nearly impossible in the Carpathians, they had to search for other ways to earn a living. Apart from carpentry and handicrafts, they were the ones who produced wheel lubricants referred to as ‘cart grease’, which was used to grease the axle of wooden carts. 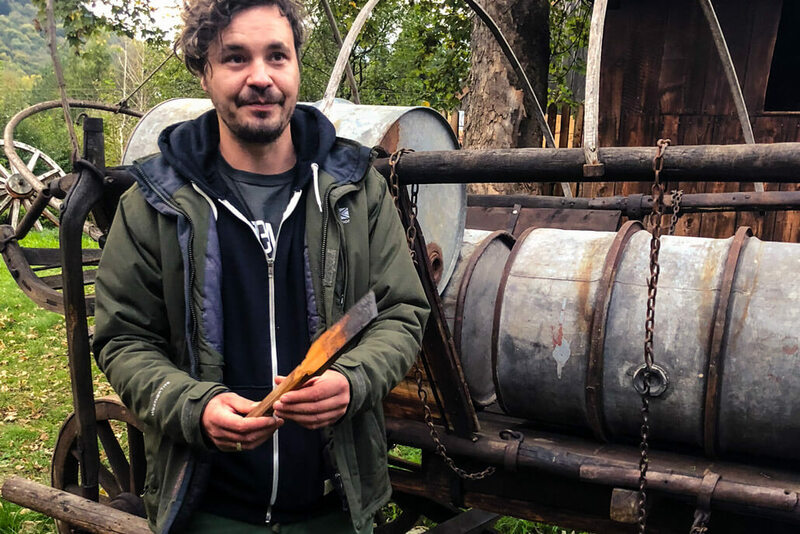 During the oil rush, they started distilling the grease from crude oil. Since it had a huge success, they began travelling and selling their goods abroad, some even moving as far as to the US. Those who stayed built exquisite homes with hot water and even wallpaper, which was a luxurious perk at that time. That’s why they were called maziar people, the ‘greasers’. Here, just south of Gorlice, this group of Lemko people was the only one who travelled. So not all Lemkos were maziari, but all maziari were Lemkos. The last maziar stopped travelling and selling oil in 1971 and, as of today, he’s the last maziar alive at the age of 93. 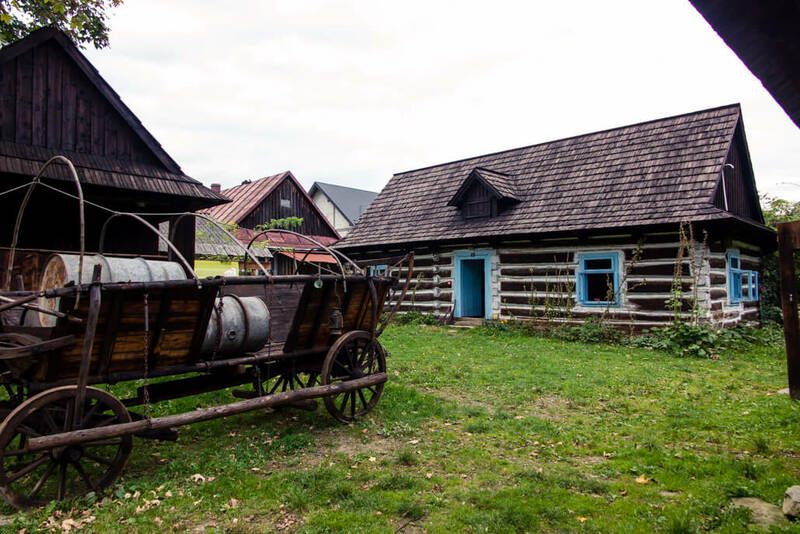 To learn about the Lemko people and their culture, visit the village of Łosie and their open-air exhibition of the ‘Zagroda Maziarska in Losie’ (website in Polish only). A wooden spatula used for selling small amounts of the grease. It was believed that if a woman managed to steal a maziar’s spatula, she’d get married to a rich man within 3 years! 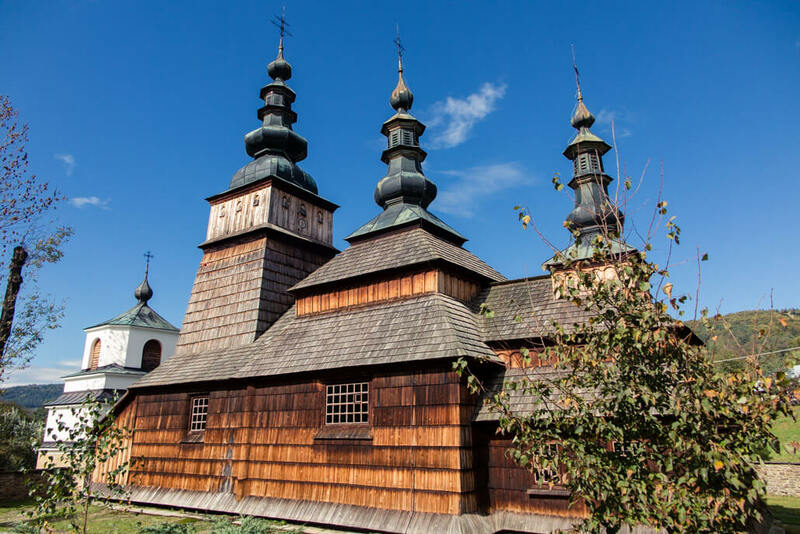 The area is sprinkled with beautifully preserved wooden churches. Some are Orthodox and some Catholic ones. 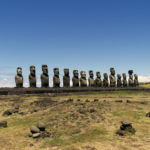 Many of them have even been inscribed on UNESCO’s World Heritage List. We visited an Orthodox church in a village called Owczary, which was built in 1653 and named The Greek Catholic Parish Church of the Protection of the Mother of God. The beautiful wooden structure had to have its shingles restored in the 1980s. Inside you’ll find a baroque iconostasis from the same period – one of the oldest in the region. It’s essentially an altar and a wall in one, which separated the priest and the praying people. Iconostasis is a common feature in Eastern Orthodox churches. I’ve seen a lot of them in the Balkans and Caucasus. Each icon painted on the Iconostasis has a meaning. The most valuable ones are at the bottom. The Christ is portrayed at the very top – back then it was believed paintings were more honest and valuable, so they were preferred to sculptures. Other notable churches in the Southern Lesser Poland area include Catholic churches in Binarowa and Sękowa, and Orthodox churches in Brunary and Kwiatoń. 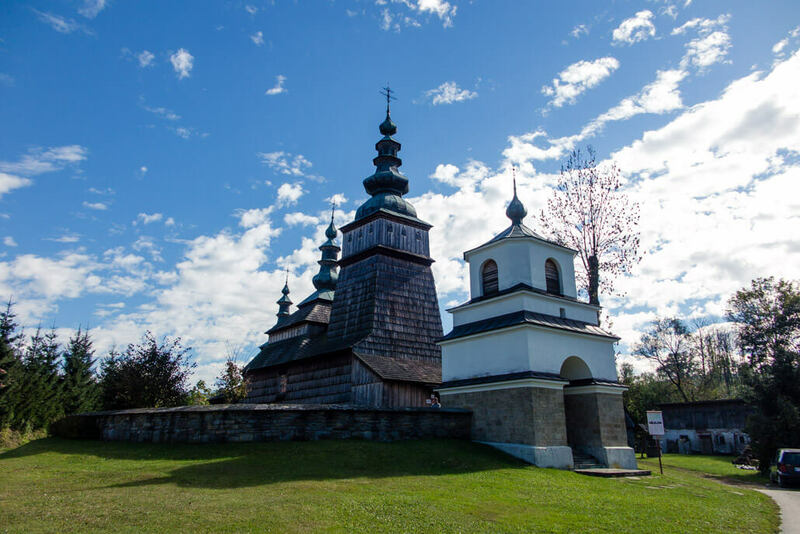 Owczary Church from the back – Aren’t the wooden shingles beautiful? 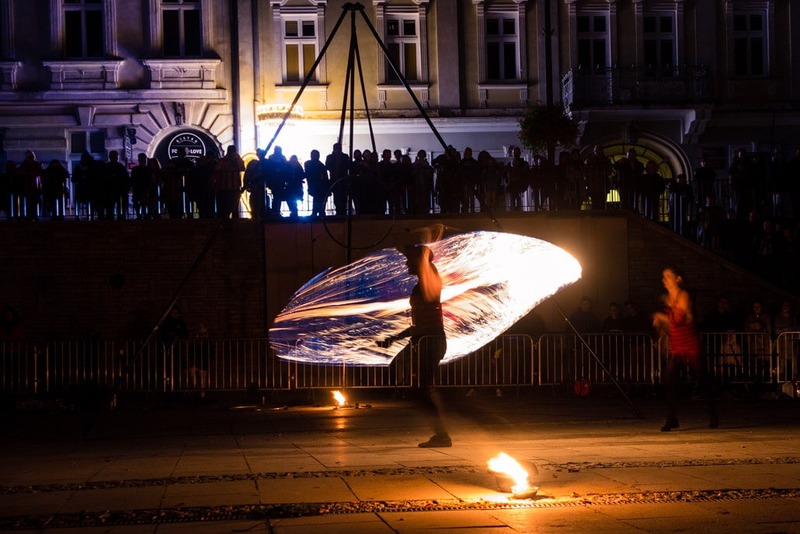 You might not expect it but there’s actually quite a few adventure activities you can engage in while in the Gorlice region. My no. 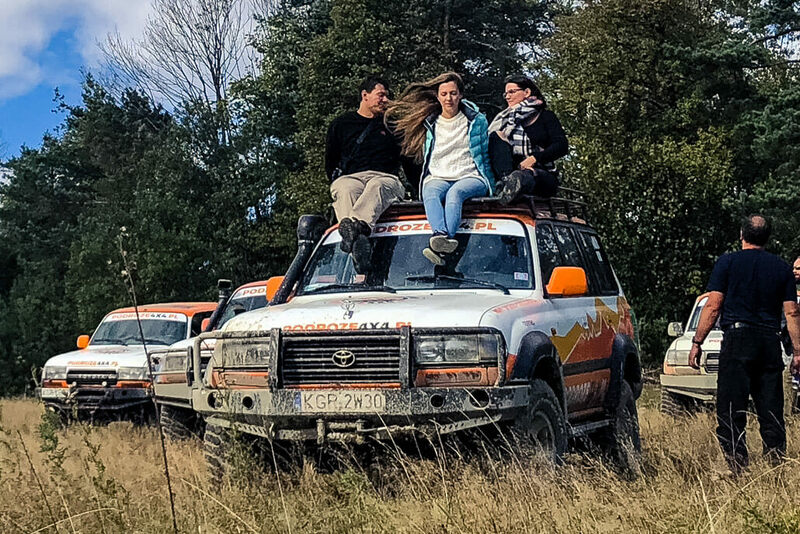 1 tip is to get in touch with the guys at Podroze 4×4 and have a nature adventure arranged. They have special permits allowing them to go to the nature reserves and take you on a fun ride in their 4x4s! 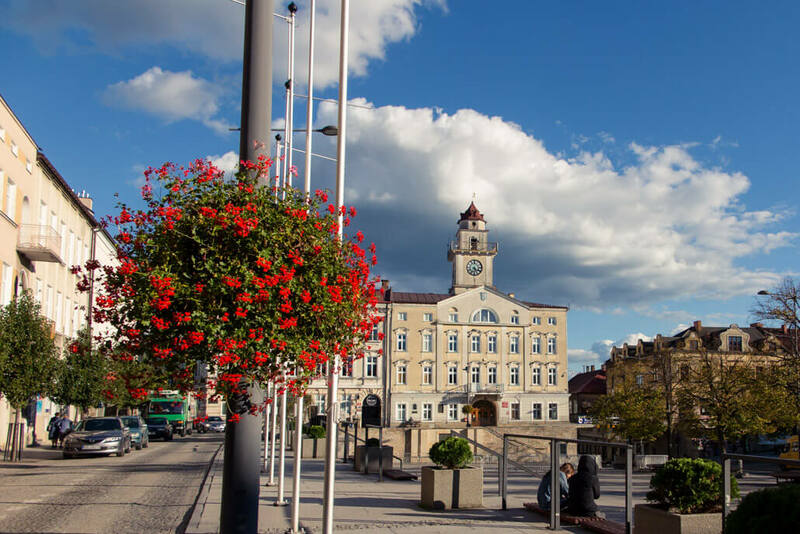 Located right in the very heart of Gorlice – at the Market Square (Rynek) – stands the majestic city hall. Originally built from wood, the city hall went up in flames in the 17th century and had to be rebuilt in the 19th century. It’s right in the building of the city hall that Ignacy Łukasiewicz had his pharmacy, where he conducted his experiments with the kerosene oil. Łukasiewicz had the pharmacy decorated with a large wall fresco depicting the Greek goddess of health Hygeia, which you can still admire on the ground floor. 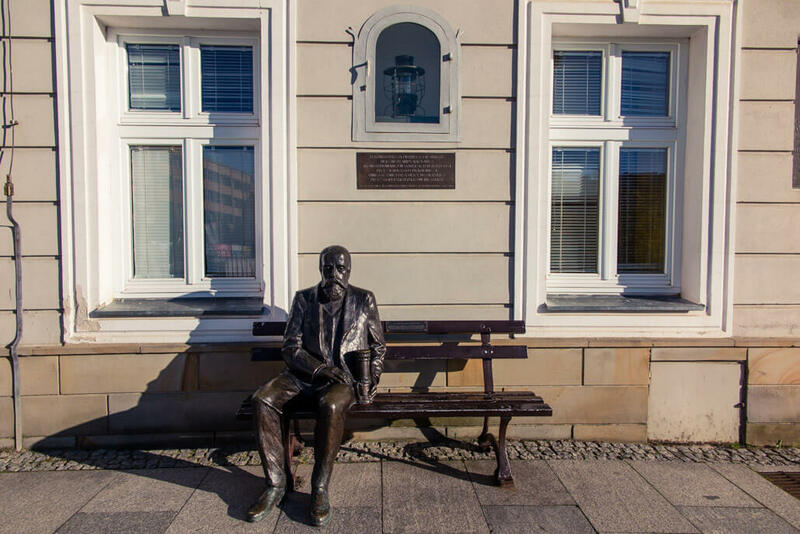 Right in front of the city hall, you can rest on a bench where a bronze statue of Łukasiewicz will keep your company. :) There’s also a kerosene oil lamp in larger-than-life size commemorating the famous invention. The clock tower was added after WW1. The views from the top are absolutely stunning, especially during sunset. You can get up there by arranging your visit in the Tourist Information Centre located on the lower part of the square just by the City Hall. 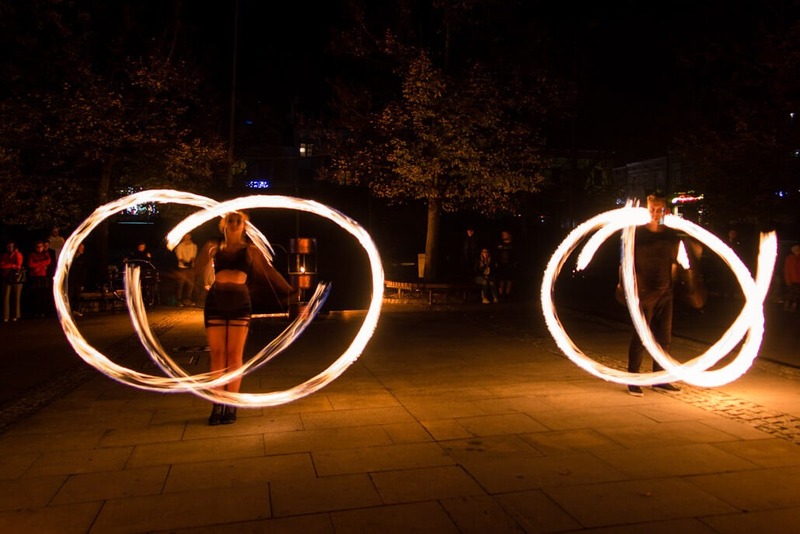 That’s also where you can arrange anything for your pleasurable stay in Gorlice. 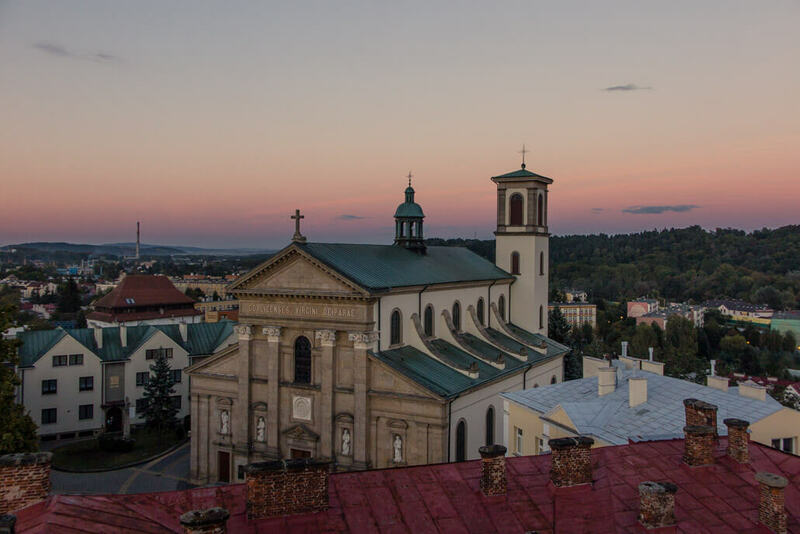 I know what I’m talking about – I was in Gorlice on a trip fully arranged by the awesome ladies and gentlemen working at the Info center that happens to double as a local tourism board. To the left of the City Hall you can find a beautiful church – it’s a basilica minor of the Birth of the Virgin Mary. Built in the neo-Renaissance style in the 19th century, the church was badly damaged in WW1 and had to be rebuilt. It has enjoyed the status of a basilica minor since 2008. I didn’t go inside the Basilica, but apparently there’s a lot to admire there. Apart from the usual central altar, there’s a side altar featuring a sculpture of Jesus in prison, which Gorlice locals come to pray to. Minor Basilica of the Birth of the Virgin Mary – most beautiful when seen from above. The side of the Market Square opposite the City Hall is lined with colorful tenement houses. The historical buildings come from the 17th and 18th centuries. I recommend taking the time to inspect each and every one of them, stopping mainly at no. 6. 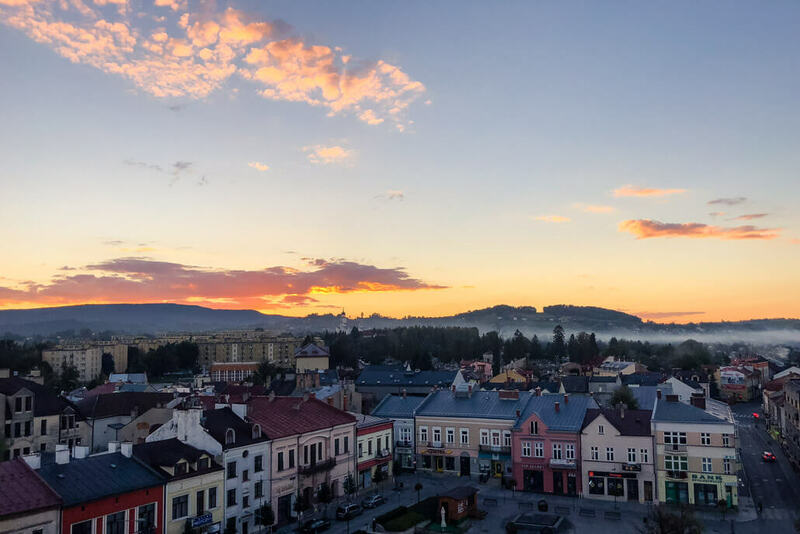 Sunset over Gorlice’s tenement houses… Isn’t it precious? 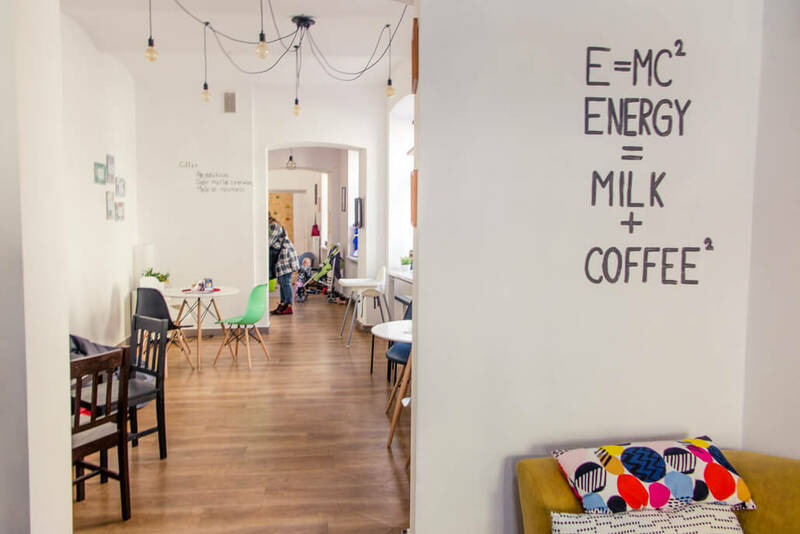 The best café in Gorlice: Karuzela! Gorlice surprised me with its amazing restaurants. 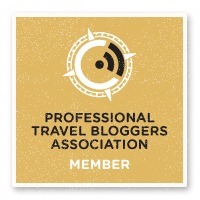 I managed to visit three of them and can recommend them all! 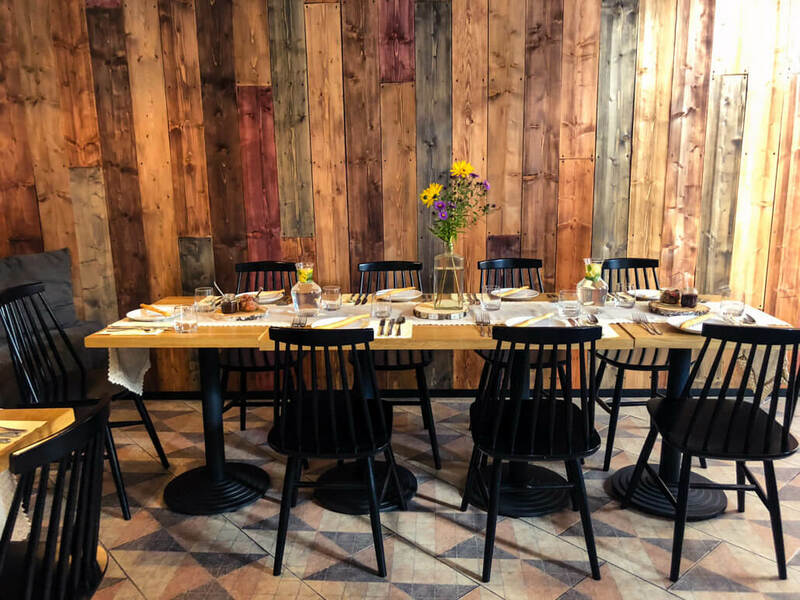 A stylish restaurant named ‚Goose bumps‘ in Polish operated by a local family, focusing on fresh local ingredients. The local soup made with mushrooms was amazing, the burger we had was not too special and the plum cake was to die for! Highly recommended! I wish we were not so full when coming to U Polki i Allana :D Still, though, we enjoyed their homemade Polish soup with sausage and a lovely meaty dish. Despite the modern look of the restaurant, the cuisine they cook is quite traditional. A ‘normal but good’ local restaurant. We came for pierogy, the Polish stuffed dumplings. They were delicious! Don’t mind the restaurant’s name, it’s a very decent place located partially underground. 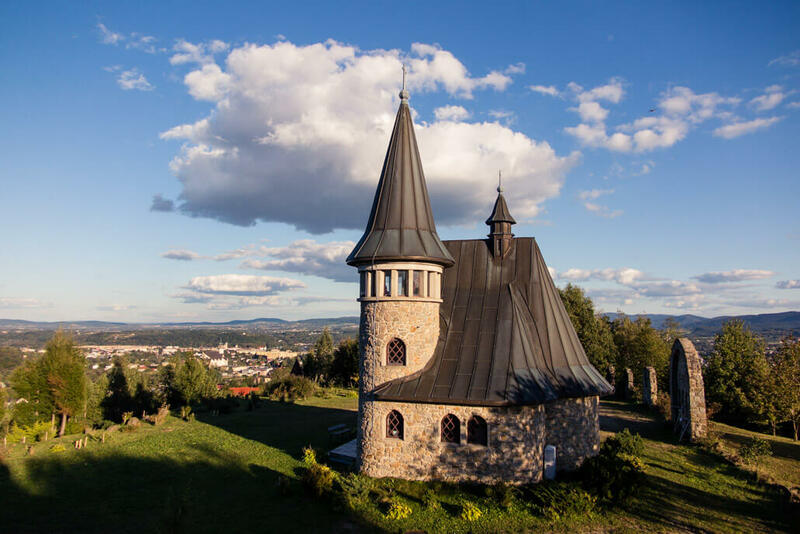 A hill near Gorlice called Gorlicka Golgota has a lovely little chapel built on its top. 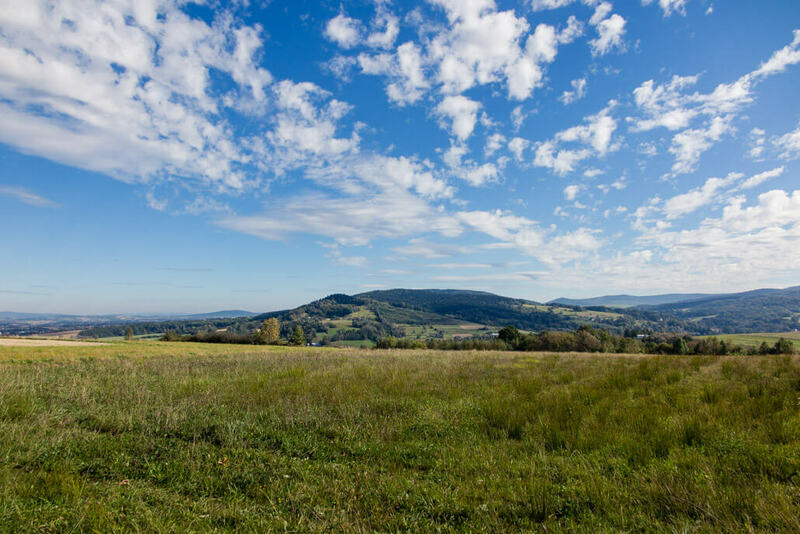 From there you can enjoy peaceful views of Gorlice and the surrounding areas. The place is best to be visited during sunrise or sunset. Gorlice doesn’t lie on the beaten path and so it might be a bit tricky to get there. The best option is to just drive a car. If that’s not an option, you can take a bus from Krakow. There are 2 companies operating frequent connections between the two cities – Voyager and Dartur (Polish only). 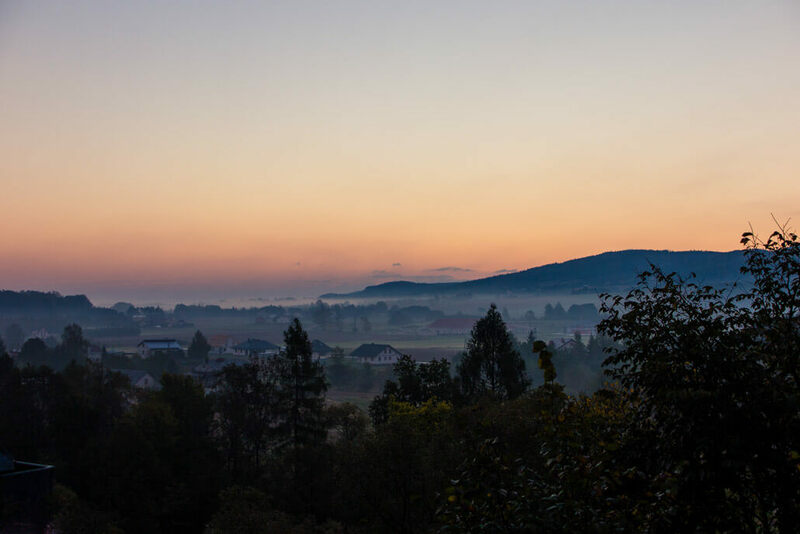 Gorlice waved me goodbye with this gorgeous sunrise… Thank you! If you plan to visit the region, I highly recommend getting in touch with Gorlice Tourism Board, which can help you plan your stay. 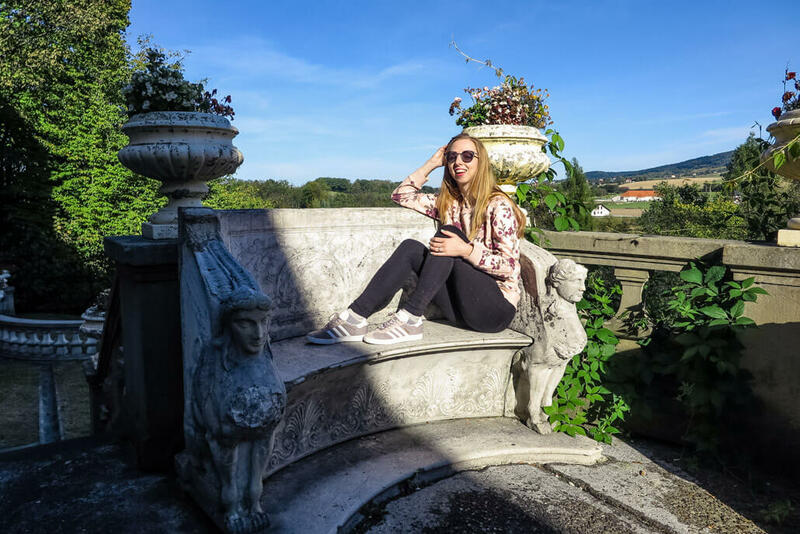 Disclosure: Veronika of TravelGeekery visited Gorlice on a press trip arranged by Gorlice Tourism Board. All opinions are her own and unbiased. This post makes me want to put Poland on our list. 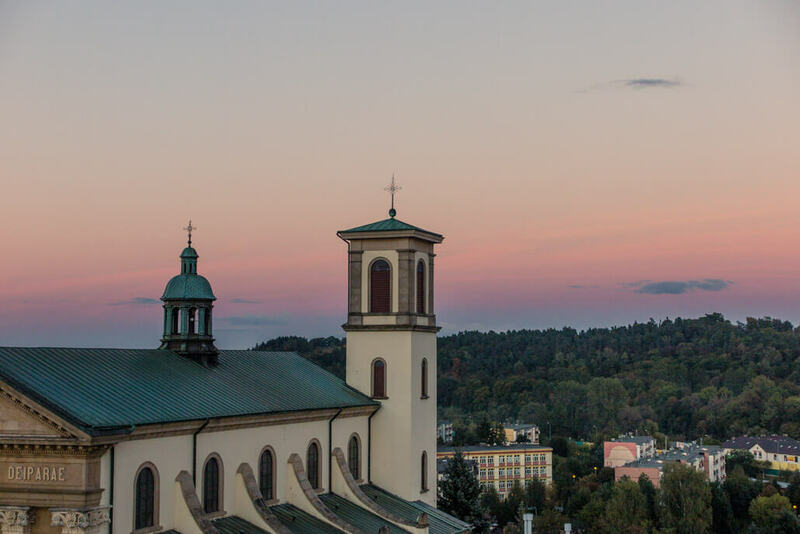 Gorlice has it all, nature, typical architecture and a place where they serve a damn good coffee! Ok. This was such a cool post! I had no idea this place existed and your pictures are absolutely gorgeous!!! It looks like such a cool city! Love hearing the history of Gorlice. The Iconostasis is beautiful and am glad to learn what that is. Lovely pictures. 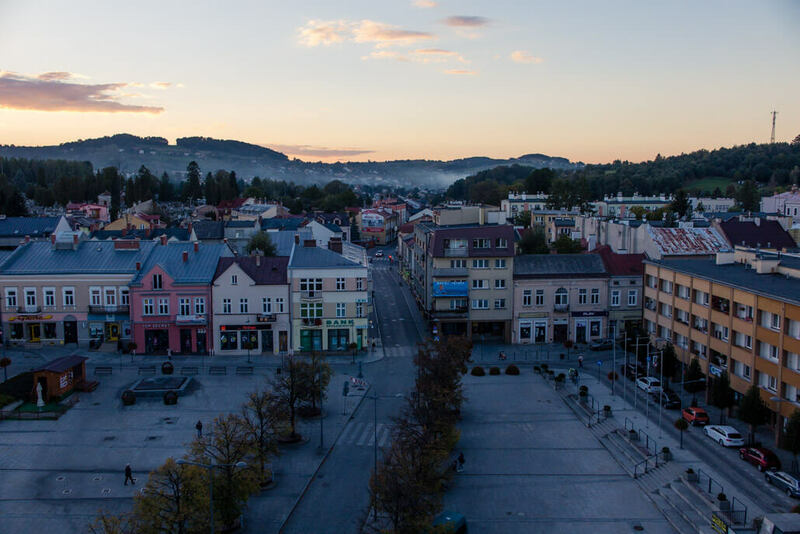 Gorlice, Poland is somewhere I have literally never heard of it and it looks fascinating! I would love to stay at the Palace and take the 4X4 ride, thank you so much for the work you put into this post and introducing me to somewhere I have never heard of before! Looks like an adventure for sure! Wow! I was born in Gorlice, wonderful places, history, climat. Thanx for article!